While the protests of the anti-pipeline advocates in the Lower Mainland of BC appear to have succeeded with the BC government's announcement today do not be so sure that this will not mean pipelines will not reach the pacific coast for Supertanker export to Asia. 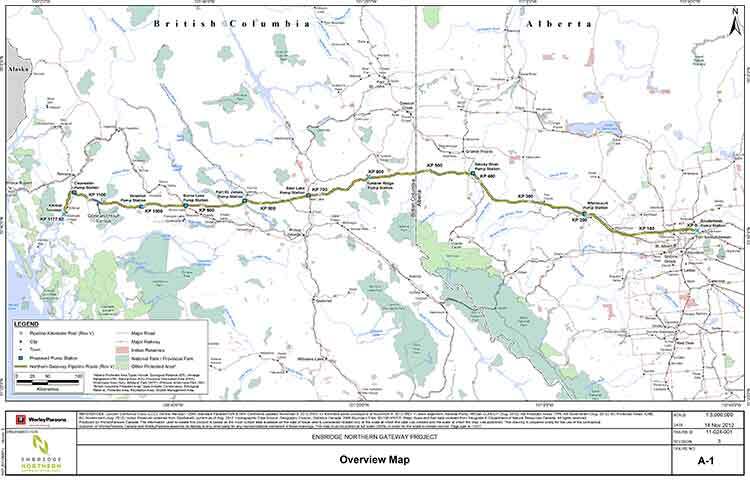 This is the pipeline to go from Bruderheim, Alberta, a small town south of Edmonton, to Burnaby BC it is NOT the controversial Northern Gateway Pipeline which is also proposed to go to the Southern Coastal waters of the province, ending up with a deep water port in Kitimat, in the Hecate Strait. While this pipeline will end up in Burnaby, home of the Left Coast revolutionary hot bed of Simon Fraser University , it is merely an expansion of an existing pipeline, going to an existing refinery. A refinery that is still functioning though it was built in 1938 a year before World War 2.0 the refinery is 80 years old now. It is what they call in business a gravy train, it has already been paid for years ago, even any upgrades have paid themselves off so any money made is pure profit. Two pipelines were proposed to travel to the Vancouver -Kitimat coastal area, with the idea of building deep water ports in some of the roughest most dangerous water anywhere on the Pacific coast. It appears with this decision and the Federal governments conditions on the Northern Gateway, that pipelines going to Kitimat or Burnaby are now not going anywhere. So where will a pipeline be built to get Alberta bitumen to market? There’s a dumb, dumb, really dumb idea that just won’t go away—that Enbridge could solve all its problems if only, if only, it would send the Northern Gateway Pipeline to Prince Rupert.Enbridge long ago rejected the idea. Before Enbridge updated its website to make Gateway Facts, to make it slick and more attractive, the old website had an FAQ where Enbridge explained why it wasn’t going to Prince Rupert. TransCanada was selected by Progress Energy Canada Ltd. to design, build, own and operate an approximately 900-kilometre natural gas pipeline (approximately 780 km terrestrial and 120 km marine) running from Hudson’s Hope to Lelu Island near Prince Rupert. TransCanada provides update on Prince Rupert Gas Transmission projectAlthough the start date of the Prince Rupert Gas Transmission Project is largely out of TransCanada's hands, vice-president John Dunn told the Prince Rupert and District Chamber of Commerce the company will be ready to go should the time come. "Pacific NorthWest LNG is working to receive their necessary regulatory approvals and it is up to our customer to look at the global and fiscal environment for LNG and make a positive final investment decision. we will be ready to commence construction as soon as that occurs," he said of the Lelu Island terminal that will receive gas from the line, noting construction also depends on regulatory approval from the B.C. Oil and Gas Commission for the pipeline.Dunn said the delay in a final investment decision by the project's lone customer does not mean TransCanada's work on the pipeline has come to a halt. With the company expecting to announce three prime contractors for the approximately 900 kilometre pipeline later this year, Dunn said there is a lot going on in the background. "One of the things that the announcement in December mention is that both Pacific NorthWest LNG in terms of their terminal at Lelu Island and PRGT in terms of its pipeline are working very diligently with major constructors to drive the cost down. We are taking the opportunity with this pause in the decision to basically look at realigning the costs across the project, whether it be materials or whether it be suppliers," he said. Not only is BC planning on building a LNG gas line along the Yellowhead they also plan on building deep sea ports for Tankers off the coast of Prince Rupert which could accommodate raw bitumen from Fort McMurray or upgraded petroleum distillates from Edmonton . The Yellowhead already has a major highway, railway and existing pipelines so the environmental damage in comparison to the southern routes is not as significant, the community disruption is less and the potential for long term jobs in this region make it an attractive proposition that should have been considered in the first place. It also fits in with the provinces plan of expanding its hydro dam operations in the Northern Peace region that it share with Alberta. The third dam – "Site C" – was also proposed at the time for a site 83 km downriver of the Peace Canyon dam, or approximately 7 km southwest of Fort St. John. Currently the Site C dam proposal is facing protests as well. But if I were of a conspiracy frame of mind, I would say that with this rejection of Kinder Morgan and the delays over North Gateway, despite the protests against the Site C Dam the BC government could not have planned it better if they had adhered to central planning. Will the Northern Gateway be built further North, along Highway 16, the infamous Trail of Tears where hundreds of First Nations women and girls have disappeared. It appears that if any pipeline is going to come from Alberta to the BC coast it may be along the Trail Tears giving more poignancy to the appropriateness of that name. Mr. Mcleod has given the government six months to change forty four years of right wing boondoggles created by PC regime and the thirty five years of right wing single party state of the Socreds. Wow what generosity. Six months vs. seventy five years. The writer does not declare his political party affiliation though his complaints resonate within the echo chamber of the Wildrose supporters, in fact the whole myth of lack of communication is the reason d'etre that they use to criticise our Premier, whom he dismisses as Mrs. Premier. Claiming that Bill 6 was forced on Albertans is a lie, the PC's actually had the bill in planning. He knows this as do the rest of the protestors against protecting Farm Workers, legislation all other provinces except Alberta have. Their lobbying efforts resulted in a few thousand protesters, a handful of no significance except for their having been organized by the opposition parties. Compare that to the thousands upon thousands of Albertans who communicated their displeasure with Ralph Kleins Bill 11. This protest was a communications error in that the NDP should have called the WR out on it. Finally like the other losers in this election who support Republican like politics in Alberta, the writer threatens the Premier and the government with Posse Communitas Militia like action if they don't change their ways. In this day and age of domestic terrorist threats, I am surprised the editor allowed this clear call to violence against the Premier and her government to be published. On the other hand perhaps it is good that people see the violence the minority of right wing backers of the opposition are willing to contemplate. It is unfortunate that those who lost the election though think they have the right to threatened armed violence if they don't get their way. That's not Alberta thinking thats Oregon. As you may have noticed, I have been uncharacteristically quiet regarding our New Democrat regime now well ensconced in the provincial legislature. I adopted this policy as I felt it only reasonable to give the premier and her government the time to show us “their true colours,” and, besides, the provincial Tories so badly messed up the process that a little patience is mandated. However, from what I’ve seen over the past many months, I think we now have an appreciation for the government’s true colours: black, red and yellow. Now, before you grab your atlas and tell me these are the colours of the German flag, the NDP colours have some very non-German meanings. Red, for the premier, represents her love of spending – the more red ink – the merrier. Naturally, the credit agencies have responded by dropping Alberta’s credit rating, a normal response whenever they see a government losing total touch with reality. Black, on the other hand, represents the mood of the people of Alberta, and the state of our economy – I’m sure it’s no grand revelation to you that there is a lot of anger in our province, an anger that appears to be growing daily. Finally, yellow represents – again no surprise – the cowardice the government has shown in dealing with the voters of this province. This government has attempted to push through legislation while studiously avoiding any discussion with the groups that will be affected by such legislation. Bill 6 is one of numerous examples. When a government refuses to discuss its plans, or explain its actions, it creates an atmosphere of suspicion and fear, and these two emotions – along with anger – are alive and well in Alberta. Over the last six months, I have heard countless stories about what the proposed legislation means to the average Albertan. I’ve been told the government plans to seize the farms of Alberta farmers, in order to set up the countless windmills they plan to install. I’ve also been told that the windmills have already been ordered. Others have informed me that the carbon tax imposed on Albertans will generate revenue to be sent to poorer, foreign nations, who cannot afford to implement the solutions agreed upon at the Paris environmental conference. None of the money will stay in Alberta. I’ve heard the government plans to shut down all facilities using fossil fuels, including coal, petroleum and natural gas, which would appear to cover every facility in the province. Likely, you’ve heard dozens of other versions. My anger with this government stems from the fact that the NDP have done a terrible job explaining its plans, outlining its legislation, or discussing, with anyone, the effects of all these plans and legislation. When a government fails at its primary duty of communicating with the people, then rumours, half-truths and lies fill the air, and that’s what is happening in Alberta. Mrs. Premier, this is totally unacceptable. The people of Alberta deserve better than what they are receiving. Premier Ralph Klein proved that Albertans are willing to face bad news, as long as they are included in the discussions, and understand the process. What they will not accept is silence, misinformation, and double talk. U.S. Senator Robert F. Kennedy once observed, “Those who make peaceful evolution impossible make violent revolution inevitable.” In Alberta’s case, the peaceful evolution has been rendered impossible by the government’s own refusal to listen to the people, talk to the people, and, in an overall sense, communicate, period. Mrs. Premier, the people of Alberta are not doormats and will not tolerate being treated as such. Someday, somewhere, someone is going to start pushing back. Brian McLeod is a long-time resident of St. Albert.